Ohio’s transit agencies are in a world of hurt. Both Cincinnati’s SORTA and Cleveland’s GCRTA are facing budget crises. Even Columbus’s COTA — which has been in an expansion mode — is now facing a shortfall. Agencies statewide are up against a vicious cycle of sprawl, says Ken Prendergast at All Aboard Ohio. State policies transfer infrastructure funds from urban areas to rural areas, promoting sprawl. That hurts services in urban areas, reinforcing the pattern. 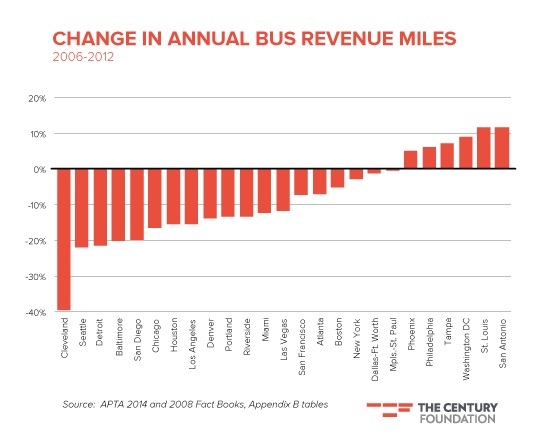 As people spread out, the tax base on which transit agencies depend becomes weaker. Nearly all of Greater Cleveland was once contained wholly inside Cuyahoga County. It had a county population of 1.8 million when the Greater Cleveland Regional Transit Authority (GCRTA) was formed in 1974 and funded with a 1-cent, permanent, countywide sales tax. Since then, as Greater Cleveland’s population stayed stuck at 2.2 million yet sprawled into adjoining counties, Cuyahoga County’s population fell by 500,000. With fewer people living in and buying things in the county, GCRTA’s sales tax revenues dropped by $68 million per year, according to Ken Sislak, vice president of the transportation consulting firm AECOM. No major city in the USA has cut more service-hours of transit since 2005 than GCRTA which is also facing a $600 million state-of-good-repair backlog. That includes a $280 million replacement of GCRTA’s 35-year-old rail fleet that keeps shrinking in size as more rail cars are cannibalized to keep the rest of the trains running. This year, GCRTA addressed a $7 million shortfall with $3.5 million in savings from painful cuts to rail and bus services and another $3.5 million generated by raising fares. Those actions usually create a death spiral for transit agencies. The MCO sales tax hit to GCRTA is projected to be $18 million in 2017 and rising above $20 million thereafter, all of which may have to be addressed by route and service cuts, not fare hikes. If so, it would represent a hit to services six times worse than this year’s cuts and will deny access to jobs, education and health care for thousands of Greater Clevelanders. Elsewhere on the Network today: Transportation for America explains a new policy in Illinois that will help finance transit projects. Mobilizing the Region examines where transit ridership is growing and where it’s not in the greater New York area. And Green City Blue Lake says a new long-range plan will give northeast Ohio a chance to reverse unhealthy trends. Updated at 1:22 p.m. to add a better graph.